Liverpool play Chelsea with their title dreams on the line just like how it was in that fateful game back in 2014 where the Reds lost. Manchester City play before this massive kick-off away at Crystal Palace so the game may assume even more significance. Jurgen Klopp has assured the Liverpool fans his side will not choke as they did five years ago to gift the title to City. Chelsea though will not be in a mood for charity as their top four dreams hang in the balance. A close fight with Arsenal, Manchester United and Tottenham Hotspurs has made the race for Champions League places as attractive as the title race itself. If you are looking for the live telecast and online streaming of the Liverpool vs Chelsea, English Premier League 2018-19 match, then you can find the relevant information here. Liverpool vs Chelsea - Live Football Score Updates. Andy Robertson who has been bombarding his way up and down the left -flank throughout the season for Liverpool will mark his return to the starting eleven after the missing the game against Fc Porto. Joel Matip and Virgil Van Dijk is probably the best defensive partnership in the league, and the Blues will find it tough to pepper the Liverpool goal. Mo Salah has looked in the last two games which is good news for the Reds fans. The Egyptian will be looking to combine well with Roberto Firmino and Sadio Mane to find the back of the net. Naby Keita could keep Georginio Wijnaldum out of the side as he has been in fine goalscoring form recently. Emerson Palmieri and David Luiz will return for the Blues after being rested in the mid-week Europa League tie. Ruben Loftus-Cheek has seen his value appreciate considerably at Chelsea recently and the Englishman should start along with the returning N’golo Kante. Callum Hudson-Odoi and Eden Hazard should flank Olivier Giroud on either side to make up quite a strong front three. Chelsea will boast of a significantly strong bench comprising of Gonzalo Higuain, Ross Barkley and Matteo Kovacic. These players have the capability to turn the game on its head if things are not going according to plan for the visitors. When is Liverpool vs Chelsea, EPL 2018-19 Football Match? Know Date, Time and Venue Details. In the English Premier League (EPL), Liverpool and Chelsea face-off on April 14, i.e. Sunday. The football game will take place at the Anfield, with the start time of 09:00 pm (IST). Where to Watch the Live Telecast of Liverpool vs Chelsea, EPL 2018-19 Football Match? The official broadcaster of the English Premier League in India is Star Sports. So the fans will be able to catch Liverpool vs Chelsea live match action on Star Sports Select 2 and Star Sports Select 2 HD channels. 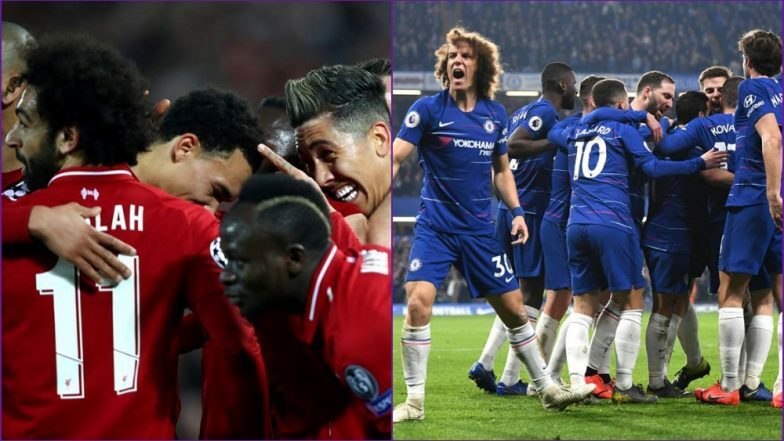 How to Watch the Free Live Streaming Online and Football Score Updates of Liverpool vs Chelsea, EPL 2018-19 Football Match? If you are looking where you can watch the online streaming of the match, then you can log on to Star Sports' live streaming service, i.e. Hotstar. You can also catch Liverpool vs Chelsea live football score updates on LatestLY, by clicking here. Expect Liverpool to drop points as Chelsea will not crack considering they have to be part of the top tier of European football next season.